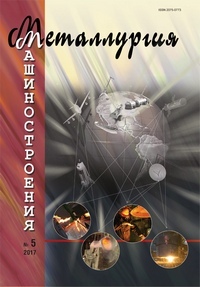 The technological aspects for using of perspective magnesium-containing materials (for example, flux Flumag, periclase-chromite powder, iron of direct reduction from siderit’s ores from South Ural’s region) are discussed in this article. The technological effect in time of smelting foundry’s steel 35Л (C-Mn-Si foundry’s steel), steel 32Х06ФЛ (C-Mn-Si-Cr-V foundry,s steel) and others with using magnesium- containing materials was achieved. The content [S], [Р] was the required, the mechanical properties of steels from experimental smeltings corresponded to requirements technical standart. Key wor:Мagnesium oxides, foundry, physicochemical properties of electric steel smelting slags, perspective magnesium-containing materials, desulphurization, dephosphorization. Results of modeling of dynamic and electrochemical process of formation of protective refractory coats on internal surfaces of any complexity of the furnace equipment under the influence of current flow by the rotating electrode are presented. Designs of the anode and the cathode, parameters of external electric influence providing the optimum modes of hardening of fire-resistant layers (5...10 mm) and level of protection at contact with liquid metal are considered. The scope of electrochemical process of hardening, irrespective of a condition of collapse of working layers of the foundry equipment, at preventive and capital repairs is designated. Key wor:Refractory cover, electrochemical hardening, solid electrolyte, superionic conduction. Modification of aluminum and its alloys is done by alloying and volumetricreconstruction of the structure. Modification in the solid state to the depths of tens and hundreds of millimeters can be done in the mode of socalled superdeep penetration, which allows forming the structure of fibrous composite material and substantially changing the composition of reinforcing fibers. As a result, the chemical, physical and mechanical properties of the massive metallic solid body change. The advantage of such an approach is a high performance (fractions of seconds) of the process of micro-particles penetration and synthesis in local fibrous zones of isotopes, alloying elements and metastable compounds. Key wor:Super-deep penetration, high pressure zones, high-energy particles, aluminium and aluminium alloys. The data showing that due to carburizing and subsequent heat treatment necessary to obtain residual austenite along with other components in the surface layer, to optimize its quantity and stability with respect to the dynamic deformation martensite transformation (DDMT) taking into account the specific conditions of testing or operation are given. As a result wear resistance, contact fatigue strength and other properties can be significantly increased. Key wor:Chromium manganese steel, case-hardening, dynamic deformation martensitic transformation, metastable austenite, wear resistance. Presented are the results of an investigation aimed at establishing the regularities of formation of phase composition, structure and properties of mechanically alloyed composite metallized powders based on Al2O3 (corundum) and TiO2 (rutile) oxides, and plasma coatings made of them. Key wor:Mechanochemical synthesis, formation regularities, phase composition, structure, metallized ceramics, powders for spraying, plasma coatings. The article offers a procedure for calculating liquid metal cooling time in a cylindrical crystallizer to ensure the rythmicality of operation of all main sections of the proposed casting-and-rolling module. For determining the cooling time of liquid metal in a cylindrical crystallizer, the basic thermal conductivity equations have been used. The finite difference method in the mesh nodes applied in the crystallizer blank cross section has been used for the calculation. Key wor:Crystallizer, liquid metal, hot rolling, continuous-cast blanks, die forging. The results of investigations of the possibility of ultrasonic welding of some polymer materials manufactured in the Republic of Belarus and the Russian Federation are presented. The effect of an increase in the surface roughness of the welded surfaces on the quality of the welded joint due to stress concentration in the weld zone is established. Key wor:Ultrasonic welding, polymer, pressure, physico-mechanical properties, roughness. Production of proper-quality cold-drawn items from electric copper that are efficiently used in the machine-building industry has been achieved by enhancing the metal ductility in the zone of thermal influence of the weld, by decreasing the size of copper grains.When making a contact wire line from continuous-cast blanks the negative influence of the cast structure on the service properties of wires is excluded thanks to the thermal deformation treatment and obtaining a deformed structure; the fabricability is enhanced, and the required mechanical properties of products have been reached. Key wor:Electric copper, crucial semi-finished products, zone of thermal influence of weld, grain size, physical-and-mechanical properties, continuous-cast blank.